The way Intel (NASDAQ:INTC) is being run under its new CEO, Robert Swan, and the current outlook of Intel stock, remind me of a famous book, Swann’s Way. A lot of things are happening under the surface, but the reader (or analyst in the case of Intel stock) is left wondering whether it all makes any difference. Swan was named CEO at the end of January, after he was interim CEO for almost six months. What the board saw in him (he had been chief financial officer) was steadiness. INTC doesn’t seem to need a visionary leader. Its momentum carries it along in cloud and PCs. INTC stock pays a steady, affordable dividend, yielding 2.4%. The question for investors is, can Intel stock ever be more? INTC is known for its visionary leaders. Robert Noyce, Gordon Moore and Andy Grove made Intel the unquestioned leader of Silicon Valley. Its semiconductors still define what happens, but like Swan himself, they’re mostly in the background. 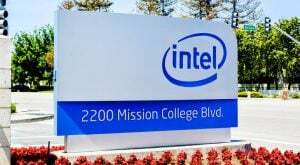 Swan’s way is to bring in outsiders to provide creative spark, like Raja Koduri , who joined INTC in December 2017 from its rival Advanced Micro Devices (NASDAQ:AMD). Koduri’s job is to go after Nvidia (NASDAQ:NVDA) in the graphics chip market and the artificial-intelligence-chip market. It’s pushing several designs and strategies, like Application Specific Integrated Circuits (ASICs) designed solely for AI, and technologies dubbed DL Boost, which are designed to improve the inference performance of certain chips. Swan is also pushing volume. Specifically, he thinks that INTC should take back the top spot in chip production from Samsung Electronics this year. Meanwhile, Intel is dissolving its memory venture with Micron Technology (NASDAQ:MU) just as that market goes through one of its periodic meltdowns, and will bring out its own chips later this year. Like Charles Swann in Swann’s Way, INTC has a tough time getting away from its past. Intel’s processors have long been vulnerable to attacks dubbed Spectre and Meltdown that rival AMD is also vulnerable to. Now a new attack has been found, dubbed Spoiler, to which Intel is vulnerable but AMD is apparently immune. Software patches were enough to take down the two earlier bugs, at the expense of performance, and that will be the case this time as well. How much performance will be affected is still unknown. But Intel has a bigger problem. Its six production facilities are falling behind when it comes to narrowing the distance between circuit lines from 14 nanometers to ten nm and then seven nm. This is at the heart of Moore’s Law, described over 50 years ago by Gordon Moore, who was later the CEO of INTC. Intel is even having trouble meeting demand for 14 nm chips because of its delay in getting to ten nm. As a result, INTC may have to bring out more 14 nm chips this year. Swan last addressed this issue publicly in September, blaming strong demand for the problems. The CEO is hoping a “rock star” outside hire, Jim Keller from Tesla (NASDAQ:TSLA), can fix the problem. Swan’s way at Intel is not that of his predecessors. He doesn’t claim to be a wizard and doesn’t assume wizardry can only come from the inside. The sheer momentum of Intel stock makes it one of the favorite tech names among conservative investors. INTC continues to grow, but at single-digit-percentage rates. Intel stock is up 16% over the last year, and last year, the dividend of INTC stock was covered by the company’s earnings three times over. If that’s good enough for you, buy Intel stock and hold it. If you want excitement, Swan’s way is not for you. Article printed from InvestorPlace Media, https://investorplace.com/2019/03/why-intel-stock-isnt-too-exciting/.